I am of the opinion that chicken soup is magic. Seriously. There is something that happens when you take your first sip of it when you are sick. It’s like you feel better. Instantly. This past Sunday, I woke up with a sore throat and by that evening I knew it was developing into something more. I decided to take the day off on Monday to give my body rest while praying it wouldn’t become a full-blown illness. I usually have a great immune system and, in fact, was just joking with a co-worker last week about how this was the first year since starting school nursing that I had not been sick. I even knocked on wood when I said it, but I guess that doesn’t actually work. Anyway, I woke up on Monday morning feeling even worse, despite all of my herbal remedies that I was taking. 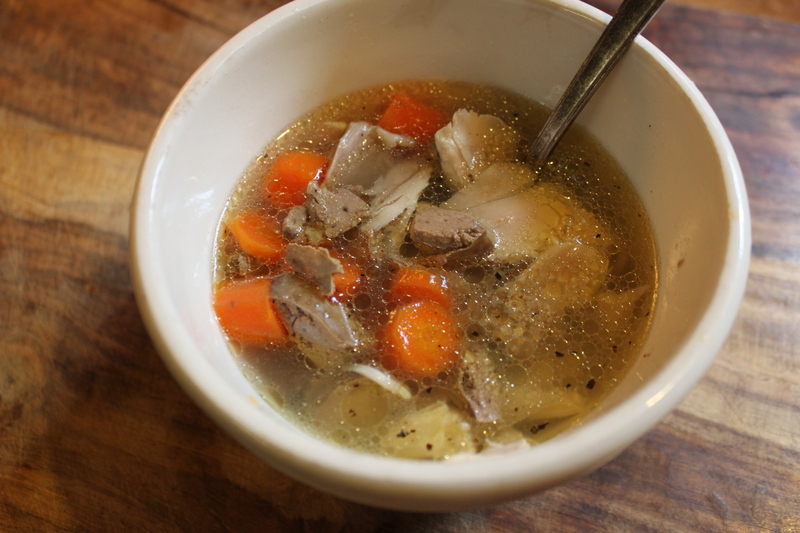 When I woke up Monday morning, all I wanted was a steaming cup of homemade chicken soup. The only problem was I didn’t have a chicken. I went out to my “old” stockpile (that’s another story) and rummaged through the cans until I came up with a lonesome can of chicken noodle soup. I had already thought it through, though. I would just warm it up, strain off the noodles and enjoy the broth. Well, my plan didn’t go so well. Can I just say that chicken noodle soup is essentially ALL noodles? Yep, it is. It should be called Can of Noodles. I ended up with only about a 1/4 cup of broth…hardly enough to satisfy me or make me feel better! It was probably for the better, anyway. I made the mistake of looking at the label after I drank the broth. I was desperate, ok? This is actually a perfect argument for cleaning out your pantry properly so that none of “that” stuff remains! So, my Mom came to the rescue and can I just say…Moms rock! Mom surprised me when she called (I had been secretly hoping she would) and said she was coming by my house. Better still, she was at the store and calling to see if I needed anything? I was like, umm, yeah…I need a chicken and some celery. Please and thank you. When Mom got to my place, I discovered that not only had she brought me a chicken and celery, she had also scored on 11 (yes, 11) half pound blocks of Organic Valley Pastured butter for $2.04 each! She bought them all. Half of them are now in my freezer. She took the other half. She is frugal, not crazy. Hello, “new stockpile”! I started putting together my soup while we talked and an hour or so (and a little work) later, I was enjoying a wonderful bowl of my version of chicken ‘not noodle’ soup. I feel better. Instantly. I told you, chicken soup is magic. I am pretty sure there is even be research to prove this. Bring to a boil, then reduce it to a simmer and let it go for about an hour. Set a timer, go lay on the couch and watch reruns of Housewives…not that I watch Housewives. I am simply making a suggestion here. Ha. When the timer dings, remove the pot from the heat and, using tongs, carefully remove the chicken from the broth. Set the chicken on a platter to cool and strain the broth into a large bowl. Discard all of the solids (I like to keep the “goodies” to chop into my soup, but that is optional) and pour the broth back into the stockpot. At this point you can just add the chicken back to the broth (after shredding it) and call it done, which is what I did above. Bring broth back to a boil then reduce to a simmer. Cook for another 30 minutes. While the soup is simmering, debone your chicken, put half of the meat away for another use (chicken salad, anyone?) and roughly shred the other half. Add the shredded chicken back to the soup just to warm through. Season with sea salt and pepper to taste and enjoy! Now, don’t you feel better, too? Instantly, right? Yeah, I thought so. I wonder if Housewives is still on? 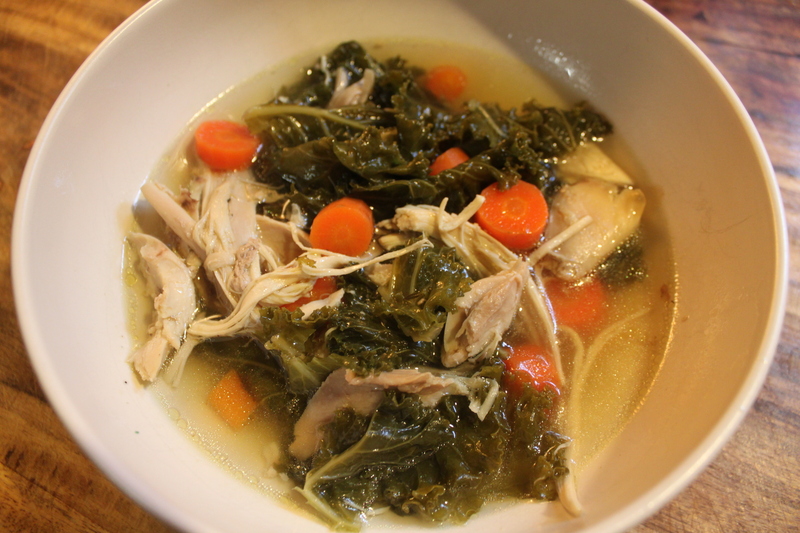 This entry was posted in Soups and Salads and tagged chicken, Kale, liver, soup.